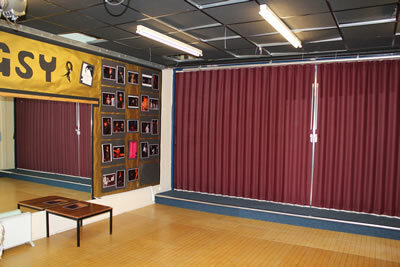 Concertina partition doors are a cost effective way of quickly dividing an area for multiple uses. 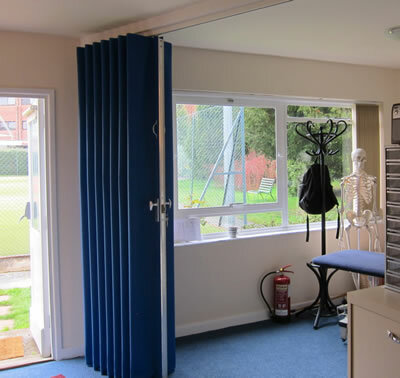 As such fabric partition systems are widely used in educational establishments such as primary schools and children’s nurseries where the configuration of the room needs to be changed quickly and easily. The fabric coating on the individual panels of the partition system is fully washable and contains antimicrobials to protect against mildew, mould, fungi and bacteria and has also been tested using MRSA prevention products making it an ideal solution for dividing spaces in hospitals and medical centres. Designed for top track hanging, fabric room partitions are lightweight, easy and smooth to operate and do not cause any obstruction on the floor space. For more information about our fabric coated concertina partition doors request a quote using our online form or call one of our team on 01373 454577. Whilst widely used to divide rooms within educational buildings and hospitals, fabric partitions can be used in almost any building that needs a cost effective solution for maximising the way a space is used. The concertina design of this partition system and lightweight construction means that they can be operated quickly and easily giving maximum flexibility. The partition is simply pulled along the track to divide the space and then pulled back when the entire room needs to be used. Concertina partition doors are also an ideal solution where there is limited wall space available for the system for example between windows, doors or other fixed furniture. Concertina partitions consist of an internal framework of electro-galvanized 6mm steel rods, nylon hinges at 1m centres and leading/trailing edge steel U-channels. The Internal framework is covered with heavy duty vinyl coated fabric with external satin anodised aluminium male/female edge profiles complete with foam rubber seals. The width of the individual folds within the concertina doors can be specified and comes in wide or narrow variations. There is also the option to include vision panels if required to allow light to penetrate (particularly useful where natural light is restricted at one end of the room). Designed as a top hung system the floor is left totally clear and the partition arrangements can be either single, double or any combination of two-way, three-way or four-way layouts. The partitions can also be curved to a 1-metre radius. The nylon cover gives an early fire warning by reacting to heat and releasing a vapour which will set off an ionisation type smoke detector. The partition covering is also fully washable and contains antimicrobials to protect against mildew, mould fungi and bacteria. In certain circumstances it may not be possible to hang the partitions due to the absence of a support structure. In these circumstances the doors are able to be made with the weight on the floor with a running track or we can even supply a frame to support the partitions independently. The Building Regulations Approved document B is very clear about the technical requirements for internal linings of communal areas to conform to Class “0”. Internal fire spread (linings) B2. (b) have, if ignited, a rate of heat release or a rate of fire growth, which is reasonable in the circumstances. Our standard covering fabric achieves Class 0 and Class 1 when tested to BS 476 Parts 6 & 7. Download our Fabric Partition Brochure to find out more. Or call our team to discuss your specific requirements on 01373 454577. Our fabric partitions are available with four different levels of sound reduction; 15dB, 24dB, 30dB & 35dB to cater for different levels of sound proofing requirements. Our fabric folding partitions are available in a wide range of modern colours which means they can be easily tied in with an existing room design and colour scheme. We hold 24 different colours within stock and individual bespoke colours are also available to order if required. Download the colour options for our Fabric Partition. In addition, they offer further flexibility by enabling different colours to be used on each side of the partition so that they can match the individual requirements of the space once divided into separate rooms. Read our case study showing how a fabric concertina partition helped Little Blossum Nursery in Upton-on-Severn to use their space more effectively.